Crews began demolishing Brooklyn’s Ebbets Field, home to seven no-hitters, 56 years ago today. Five of those no-hitters were thrown by Brooklyn Robins/Dodgers, and the other two were thrown by opponents. The one thrown by Cincinnati’s Johnny Vander Meer completed his second consecutive no-no, a seemingly unbreakable major league record. 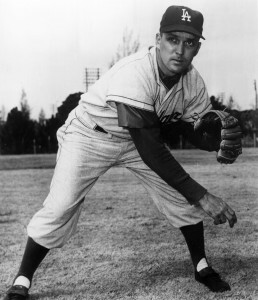 Carl Erskine is the only one to throw two no-nos at Ebbets, in 1952 and 1956. A “dignified, quiet” wake on Feb. 23, 1960, drew just 200 fans to the ballpark, as guest of honor Roy Campanella was presented with his No. 39 jersey and a locker. “The long funeral started today and it will take 10 months for the internment to be completed,” noted the AP. Note that Fred Frankhouse also threw 7 2/3 innings of a no-hitter at Ebbets in 1937 before rain ended the contest and gave the Dodgers a 5-0 win over the Reds.